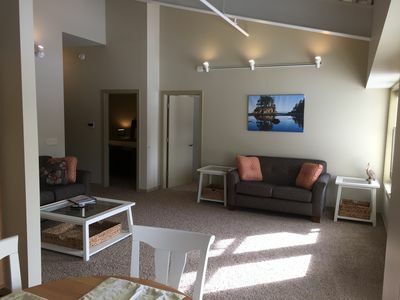 WELCOME TO ALLEGAN SHORES - a LUXURY rental property brought to you by the same owner & management team as the highly acclaimed ALLEGAN ACRES & ALLEGAN FIELDS & ALLEGAN ORCHARDS! ASK ABOUT OUR DISCOUNTED RATES FOR STAYS EXCEEDING 7 NIGHTS! 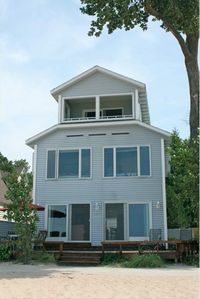 ALLEGAN SHORES is a unique, super high-end, modern oasis. 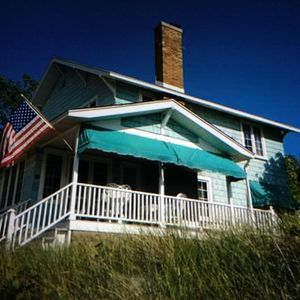 Situated on 3 acres, it is walking distance to beautiful woody hiking trails, stunning sand dunes, and in our opinion, the most gorgeous stretch of Lake Michigan beaches in the area. 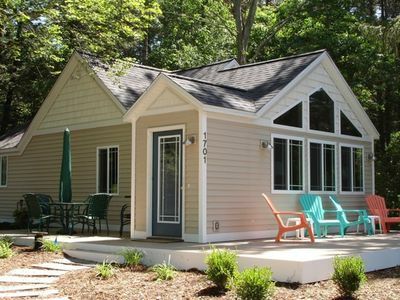 The setting is rural, peaceful and quiet, yet only a 10-minute drive to the towns of Saugatuck, Douglas, and Holland. Although you may never want to venture out, there is an incredible array of things to do in the area. 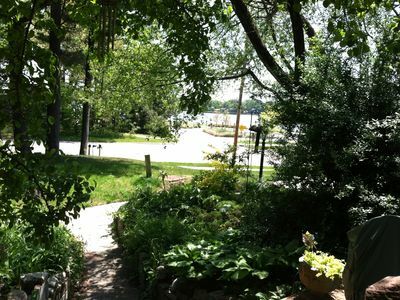 Allegan County includes the townships of Holland, Saugatuck, Douglas, and Fennville – a community often referred to as the 'Art Coast of Michigan' because of its thriving arts scene including galleries, antique shops, studios, museums, and live theater. 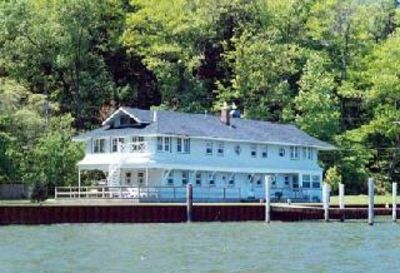 We are less than 5 minute drive to Lake Macatawa which offers boat & kayak rentals. 6 cool beach cruiser bikes & 2 kayaks are provided for your enjoyment. 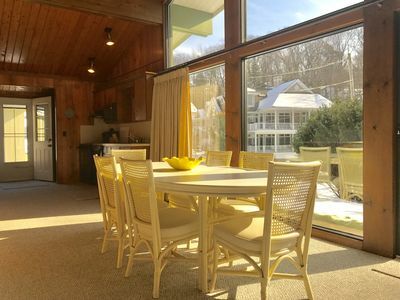 New to the rental market as of 2017, this property is a truly unique vacation rental experience. 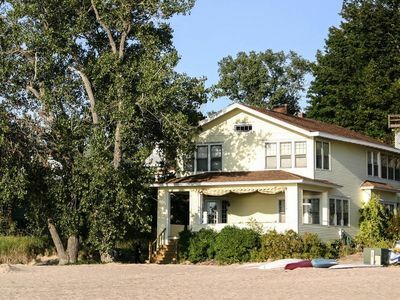 The owner lives in the house year-round, but offers the rare opportunity to rent the house for only 2 weeks during the summer. So this could be either a 2-week rental for one party, or a 1-week rental for two different parties, or even a stay of 8-13 days. 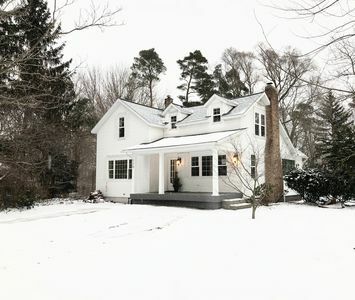 The house was COMPLETELY renovated in 2015 in an eclectic modern farmhouse style with a strong commitment to a white/neutral palate which evokes the sense of a luxurious peaceful relaxing getaway and allows the surrounding natural beauty to shine through the huge windows featured throughout the home. 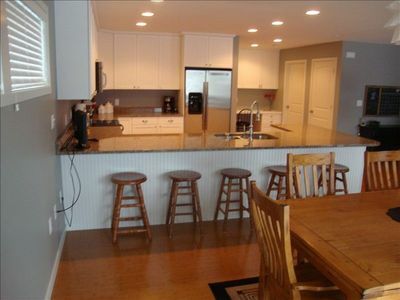 You will find that this property offers every amenity one could desire from a vacation rental, and much more. The house features hardwood floors throughout most of the home, dual-zone central A/C (separate A/C upstairs to keep things cool in the summer), and ambient, dimmable lighting. An entertainer's dream, ALLEGAN SHORES boasts 1 midcentury modern wood-burning fireplace, a great room with backyard & pool views, state-of-the-art SONOS stereo system with speakers throughout the inside & outside or of the property, high speed wireless internet & cable TV, with 1 55” LED flat-screen SMART TV with DVR in living room, netflix and apple TV. The partially-finished spacious basement features a ping pong table, living area with a second flat screen TV & SONOS speakers, and additional sleeping accommodations. Careful attention has been paid to every detail to anticipate your basic needs and decadent desires. 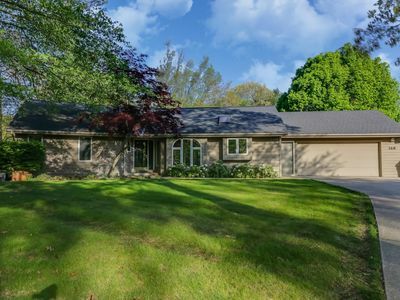 On the idyllic 3-acre property, you can choose from taking a dip in the in-ground custom-designed concrete salt-water heated swimming pool, soaking in the 8 person hot tub (open year-round), lounging around the pool deck, lounging in the hammock or outdoor sofa sectional (with gas fire pit coffee table), grilling out on our gas grill (propane provided) and dining al fresco either on the massive poolside deck or on the more intimate upper deck, all within the complete privacy of the 8-foot cedar fence. There are plenty of pool chairs, rafts, noodles and pool loungers. 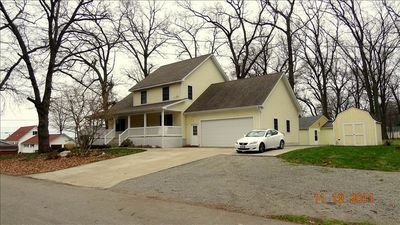 Beyond the fence, the yard backs up to another acre of prairie, trees, and a peaceful creek. 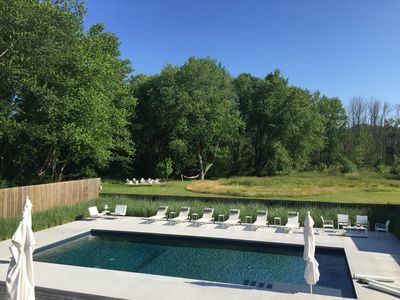 You’ll also enjoy a fire pit surrounded by adirondack chairs, as well as a poolside midcentury modern propane firepit, AND a gas firepit coffee table as part of the outdoor sofa sectional, all perfect for bonfires and s’mores. The MASTER SUITE sleeps 2 on its king bed, on the main floor of the house. It features a large en-suite master bath with walk-in shower, large soaking tub, large walk-in closet, double sink vanity, sitting chair with ottoman, and separate/enclosed toilet room. 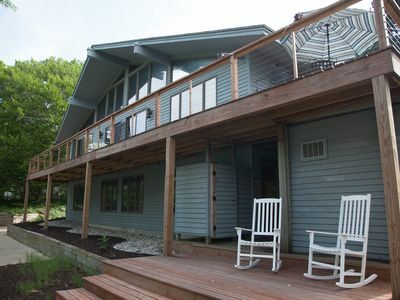 The master suite and bathroom both have stunning views of the pool and backyard acreage. The FORMER MASTER SUITE was the original master suite before the renovation. It is also located on the main floor of the house, and features a queen bed, sitting chair, and en-suite bathroom with walk-in shower. The two UPSTAIRS BEDROOM SUITES are nearly identical to each other. Each features a queen bed, sitting chair, and its own en-suite bathroom with walk-in shower. The BASEMENT BEDROOM sleeps up to 4 people and features a queen bed and twin bunkbeds. The OTHER BASEMENT sleeping area has a queen bed and a convertible day bed. 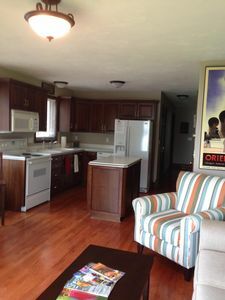 All bathrooms, completely renovated in 2015, feature a reclaimed vanity with vessel sink on top, Grohe fixtures & faucets, Toto toilets, and a walk-in shower with white subway tile, bath products niches, hooks to hang your wet bathing suits, and white river rock floor which provides a gentle massage to your feet. The POWDER ROOM, located on the main floor, is also a full bathroom. just like all the other bathrooms in the house, it features a reclaimed vanity with vessel sink on top, Grohe fixtures & faucets, Toto toilets, and a walk-in shower with hooks to hang your wet bathing suits, and white river rock floor which provides a gentle massage to your feet. With 10 foot ceilings, the spacious, modern, fully-equipped kitchen/great room, will make cooking and entertaining a pleasure. The kitchen area features 1 large Kohler white porcelain farm sink, 1 smaller bar sink, reverse osmosis filtered water tap, 2 Bosch AND 1 Miele dishawasher, quartz counter tops with huge 10-foot long island counter, stainless steel appliances (including GE oven/range and GE convection/microwave hood, and Whirlpool fridge/freezer), Zwilling JA Henckels Pro Knives, Crate & Barrel dishes, flatware, glasses and serving pieces, and every high-end kitchen gadget you could possibly imagine. Dining options include the large dining room table, as well as extra chairs & folding tables if needed. This living area features a Mitchel Gold sofa sectional and a "zero-gravity" Le Corbusier chaise lounge, midecntury modern wood-burning fireplace, and a 55” LED flat-screen SMART TV with SONOS bar speaker, DVD, DVR, netflix and apple TV. The TV is cleverly concealed behind a sliding modern barn door which adds architectural interest to the room and can be used to close off the great room from the rest of the main floor of the house. 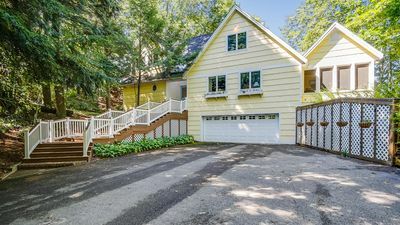 Other features include a 2 car garage, a second large driveway with ample parking areas, organic herb garden, and a mud room with a full-sized Samsung washer & dryer. There is also 1 additional refrigerator freezers in the garage. We also provide Crocs shoes of all sizes and white terrycloth bathrobes to create a spa-like experience for you, especially nice when using the outdoor hot tub. You are also welcome to use our 6 bicycles, and 2 kayaks. 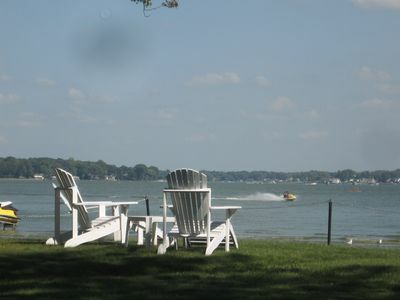 ALLEGAN SHORES is the perfect choice for family vacations/reunions, and gatherings of friends. 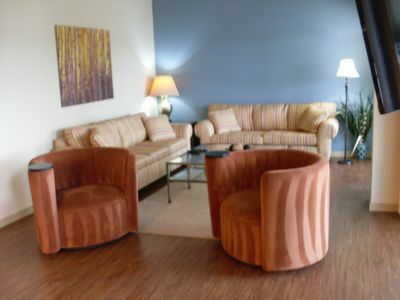 Our goal is simple: we want you to have such a great vacation experience at ALLEGAN SHORES that you will want to tell others and return again & again. 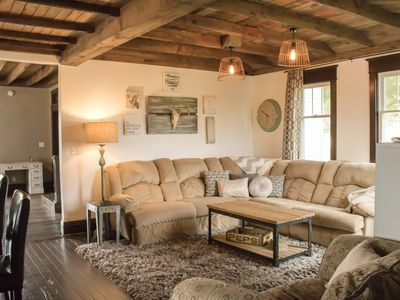 Farmhouse country setting! Amazing views! 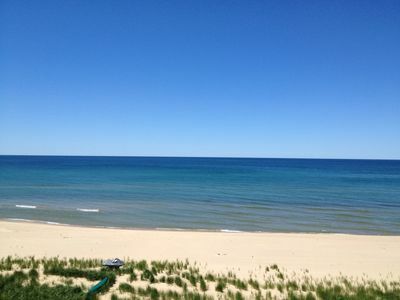 Less than 10 min to Lake MI beaches! 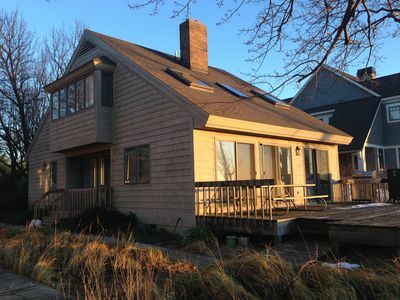 Spacious Lake Michigan Home in Holland/Macatawa - Sleep 10 - Holidays Open!